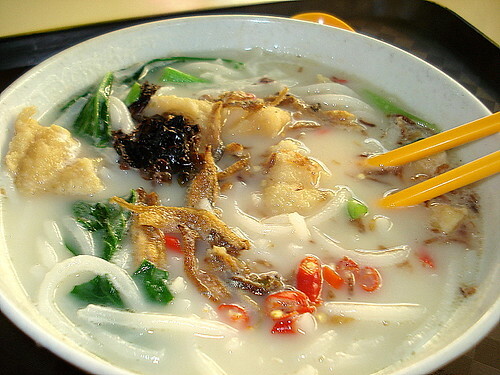 Katong Sliced Fish Soup, originally uploaded by Camemberu. This was a stall I'd been meaning to check out when I was in the mood for fish soup. Today I came over and saw snaking long queues for it at lunchtime. I came back later at 2pm and still had to queue but fortunately, they were quick with the orders. Fried Fish in Milky Soup, originally uploaded by Camemberu. Now, what was it that made people queue up? I think it was mainly the price - where can you get anything with fish for S$2.50 nowadays? It was a decent bowl, enough to fill you up but not exactly top quality stuff. The soup tasted a little bland for me but there's always soy sauce and sliced chili padi (bird's eye chili) to jazz things up a bit. How I wish the my favourite Blanco Court Fried Fish Soup would come over to Marine Parade! I'd gladly pay S$4 anytime for a bowl of that! i tot the signboard says "Kallang" instead of "Katong"? OMG you are right! 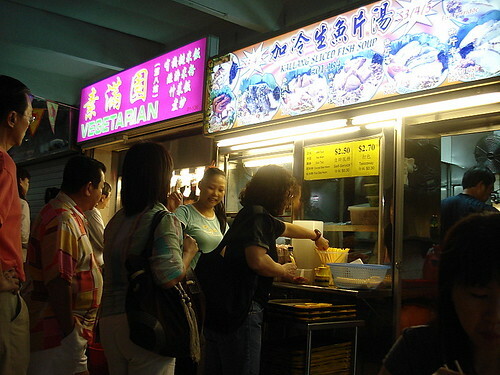 I must have been distracted by the Katong Chicken Curry Puffs next to the fish soup stall. Thanks for spotting this! Corrected the post.